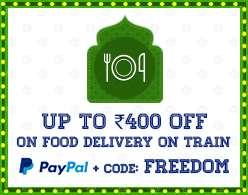 MFC Foods located near Jabalpur is the most preferred choice of RailYatris' to order food in train. Order now from MFC Foods & have a yummy journey! Happiness comes in Mini Size too. Grab on this Wow Box Mini Thali comes with seasonal veg (100g), dal (100g), plain rice (150g), roti (2), salad & pickle. Enjoy a scrumptious assortment of paneer veg (100g), seasonal veg (100g), dal (100g), jeera rice (150g), roti (3), salad & pickle packed in Wow Box. Happy Feasting! This authentic Wow Box Jain Thali comes with paneer veg (100g), seasonal veg (100g), dal (100g), jeera rice (150g), roti (3), salad & pickle. Enjoy! Be Ready to taste an amazing assortment of butter chicken, dal, jeera rice, roti (3), salad & pickle packed in Wow Box. Go for it! This yummy Biryani (300 gm) has different taste cooked with mix and fresh seasonal veg. Nicely cooked for a veggies lovers and served with raita in Wow Box. Treat on the goodness of fresh and tasty mix seasonal veg (150 gm) with soft butter roti (3) packed in Wow Box. Combos are balanced and complete meal. The dishes are made with clean and healthy ingredients. Our combo has dal fry with jeera rice. Be ready to taste this scrumptious delight on your journey. This Chicken Biryani (300 gm,1 pc) is cooked with long-grained rice flavoured with exotic spices which add more aroma to it and served with raita packed in Wow Box. A must have dish. Happiness comes in mini size too. Grab on this thali which comes with seasonal veg (100g), dal (100g), plain rice (150g), roti (2 no), salad, pickle, spoon, paper napkin and mouth freshener. Enjoy a scrumptious assortment of paneer veg (100g), seasonal veg (100g), dal (100g), jeera rice (150g), roti (3), sweet (1), salad, pickle, spoon, paper napkin and mouth freshener. The dishes are made with clean and healthy ingredients. This authentic Jain thali comes with paneer veg (100g), seasonal veg (100g), dal (100g), jeera rice (150g), roti (3 no), salad, pickle, spoon, paper napkin, mouth freshener and a toothsome sweet. Enjoy! Be ready to taste an amazing assortment of butter chicken, dal, jeera rice, roti (3p), salad, pickle, spoon, paper napkin and an indulgent sweet. Go for it! This yummy biryani (300 gm) has different taste cooked with mix and fresh seasonal veg. Nicely cooked for a veggies lovers and served with raita. Combos are balanced and complete meal. The dishes are made with clean and healthy ingredients. Our combo has seasonal veg (150 gm) with 3 butter roti. Be ready to taste this scrumptious delight on your journey. This classic punjabi pindi chole is prepared with exotic spices served with steamed fresh rice. Enjoy a mouth-watering twist with this soft paneer butter masala/shahi paneer (150 gm) that goes well along with butter roti (3). Make your journey simply tasty. This Chicken Biryani (2 pcs) is cooked with long-grained rice flavoured with exotic spices which add more aroma to it. Served with raita. Make your trip delectable with this spicy and flavoursome butter chicken with soft butter rotis (3). Happy feasting! This delighted kadhai chicken is a good accompany for your jeera rice. Make your trip tasty. Nothing can beat the flavours of these yummy aloo paratha (2 pcs) which is served with fresh curd. Enjoy! Feel like home away from home and treat yourself with flavoursome sabzi and soft crunchy pooris. Enjoy your meal! This is an all time favourite meal. Jeera Rice (300 gm) is cooked by tempering rice with jeera and dollops of ghee. You can have it with any side dish. Be ready to enjoy this Veg Fried Rice (300 gm) made with fresh and hand-picked vegetables complemented with tangy tomato sauce. Happiness comes in mini sizes too! Soft and fresh tawa roti to enjoy with your meal. Cooked in a rich, creamy masala with paneer chunks. This dish will add a zing to your tastebuds. Order right away and enjoy! Enjoy ghar ka swad with our mix veg (250 gm). Made with fresh and handpicked vegetables cooked along with spices. A perfect side dish to have on your train ride. Enjoy a heavenly treat of creamy butter chicken (250 gm). Order this flavoursome dish and give a mouth-watering twist to your journey! This mouth-watering and juicy Kadhai Chicken (250 gm) is a delightful treat for your tastebuds. Get ready to indulge chicken cooked with masala and gravy. We bet you cannot say no this classic egg curry (250 gm). Be ready to taste this scrumptious delight on your journey. This mouth-watering dish of shahi paneer (250 gms). Made with soft paneer chunks. A delightful treat for your taste buds. Get ready to indulge. Add these plain paratha to your meal and get a different taste to your meal. Chilli Paneer Gravy (250 gms) is marinated cubes of paneer fried in thick gravy of garlic and chilli make a must add to the menu. Egg Biryani (300 gm) is cooked with rice flavoured with exotic spices which add more aroma to it.